Need more information about booking Home 22905 ? GORSE COTTAGE is set on a gentle hill overlooking the Atlantic Ocean, Aran Islands, the Cliffs of Moher, Galway Bay and distant Conemara mountain ranges. Close to the famous villages of Doolin and Lisdoonvarna in County Clare. It is situated in a peaceful coastal location in the heart of a farming community,and provides relaxed and tranquil base from which to discover the beautiful west coast of Ireland. The cottage has five bedrooms, two reception rooms, a large kitchen/dining area, two bathrooms and a utility room. It is traditional at heart, but is also designed with stylish and contemporary comfort in mind. In addition to the stunning views and mesmerising sunsets, there are some breath-taking walks right on the doorstep of the cottage, where one can walk for hours without meeting another soul.....down local farm tracks, through the 'fairy fields', and along natural coastal pavements. Sorry - Parties or groups under the ages of 25 are not accepted. Proprietors of "Gorse Cottage" are not liable for any damages, loss of valuables or personal injury. The house has very good wheelchair access and bathroom equipment for disabled use. Please inform owner when booking if you'd like the disabled equipment to be left out. This is a contemporary home with a tasteful eye for traditional Irish style. With it's traditional cottage windows and white-washed finish it sits beautifully into the surrounding landscape . The kitchen is large and traditional, but with a very contemporary feel. It features solid wood cabinetry, granite countertops, a huge range-style cooker with gas hob, and a beautiful stone floor which runs through the hallways. Perfect for entertaining or just relaxing with some good Irish cook-books (provided). The kitchen also has west facing French Windows which open out onto the enclosed garden, limestone patio and picnic bench, with beautiful views of open countryside, the Cliffs of Moher and the Aran Islands. There is also a small herb garden which visitors are welcome to use (in season). There is a living room adjoining the kitchen and another separate family room. Both of the living rooms contain an Irish Waterford/Stanley solid-fuel burner and floors of solid local wood (Larch). They both provide panoramic views of tranquil burren countryside and the Atlantic sea. For most of the year twobeautiful ponies are resident in the meadow just in font of the house, and the gorse to the wes and north provides a wonderful sheltered habitat for an amazing variety of birds (including a couple of pheasant). Hares can usually be spotted in Spring and even the occasional Pine Marten. The bedrooms are all tastefully finished with an eye for comfort and simplicity. High quality beds and matresses are used in all rooms. Four of the five bedrooms look our onto stunning views of the surrounding countryside. There is a bathroom/WC upstairs and a shower room/WC downstairs. Both bathrooms are spacious, beautifully tiled, and fitted with high quality sanitary ware. Welcom pack will be available on arrival including a local newspaper with listings of all local activities and festivals. Some excellent books on the local area are also provided for visitors use. There is a small enclosed garden and play area to the back and west side of the house. This area contains a small children's play area with swings, limestone picnic bench and traditional limestone walls on the western side. Ted (ones father) lives just up the hill in the next house from ours. He keeps the keys and in is a great font of knowledge about the areas. He is very happy to help-out with any queries. We also have a house manager (Sandra) who runs the local B&B just half a mile from the house and is very happy to come help with any problems or queries. Alternatively our guests can call us if there are any problems. It's very important to us that our guests have a comfortable stay and we're very keen to ensure that any issues are addressed promptly so don't hesitate to call either Ted, Sandra or us if you need any assistance. At least one person in party needs to be over 27 years of age. This House has 5 bedrooms, 2 bathrooms and sleeps 10. It’s been listed on Holiday Lettings since 26 Mar 2007. Located in The Burren, it has 50 reviews with an overall rating of 5. The average weekly rate varies from £347 to £2781. This house is beautiful! We could not believe what a great place this was and the fantastic location and views. See The Cliffs from the kitchen window. The house is spacious, clean and has all the modern amenties. It's just a 10 minute drive into Doolin and to the Cliffs of Moher. Ted, the owner is next door and such a delight! We would stay again. Owner's reply: Thanks so much for leaving such a nice review. We really appreciate it and are very glad you had a good holiday in the West of Ireland. It is indeed a great spot. Many thanks, Cindy. Beautiful location with wonderful views, the house truly was a home from home with everything imaginable supplied - from cleaning products to tin foil. I had a lovely 2 weeks here, it is a beautiful rural setting, but close enough to Doolin Lisdoonvarna and Ennistymon for shops, restaurants, Spa at the Falls Hotel. 2 of our party took a day trip to the Aran Islands, we enjoyed fine dining in Sheedys Lisdoonvarna, Ballinalackin Castle and Cullinans in Doolin, some great music sessions in O'Connors Doolin and Nellies in Lisdoonvarna. House is very spacious with 2 living rooms (each with a solid fuel stove) as well as central heating. Power showers were great. 5 bedrooms (2 singles & 3 doubles) ideal for 2 families sharing. So much to do locally from walks, sightseeing, entertainment, relaxing with a good book ( reading material and music CD's supplied) - best house ever, loved it and hope to return. Owner's reply: It was lovely to read about the good times you had in Doolin and surrounds. Cullinans in Doolin is also one of our favourite restaurants in the area. Ballinalackin Castle is great too. We haven't tried Sheedys in Lisdoonvarna but have heard it's good.....so maybe next time. Thanks for sharing some of your tips for the area. There are so many good places to eat these days that it's hard to go wrong. Hope you can all make it back again sometime soon. We were a family of 4 adults and 4 children who really enjoyed staying at Gorse cottage. The cottage is a stunning house and is exceptionally well equipped for a rental property. There were amble toys and books for evening entertainment for the kids. Ted was so helpful in suggesting places to go and he was soot on with all his recommendations! Thanks to Cindy for the superb directions to the property and for a great holiday in Co Clare! Owner's reply: Really happy to hear that you had a nice stay. That's very important to us and makes it all worth while. It's a grand spot alright. Thanks so much for the kind words. House is exactly as advertised - lovely and comfortable and great location if you want to get away from it all but still only be a few minutes drive from lovely bars, restaurants etc. Plenty of space with the 5 bedrooms - we never even used the second living room with the tv because the living space off the kitchen is so comfortable! Would highly recommend. 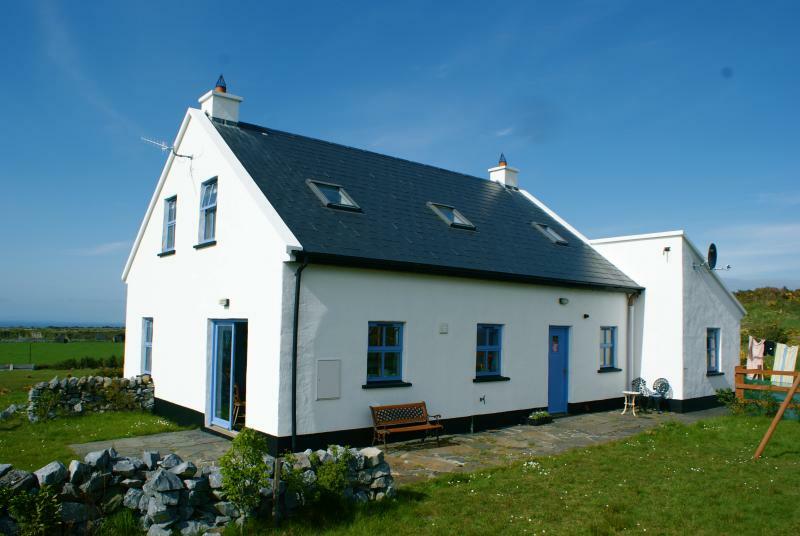 Modern but characterful house, spacious, lots of natural light, great views to both Cliffs of Moher and the Aran Islands. If you're looking for a peaceful break to recharge your batteries, Gorse Cottage fits the bill. Two or three pubs close by in Doolin with good food and music as well. Get one of the local guides (we recommend Mary Howard) to show you and explain the Burren. If you're a cyclist, do the coast road to Fanore and Ballyvaughan, it's a lovely ride. You can get in touch with Cynthia/Cathleen (the owner) through the contact form on this page. Send Cynthia/Cathleen (the owner) an email through the contact form on this page. Alternatively, if there’s a phone number on this page, you can call them. How do I contact Cynthia/Cathleen (the owner)? You'll need to send Cynthia/Cathleen (the owner) an enquiry to book - the owner will let you know how to pay. If they accept online booking they'll send you a quote and info on how to pay. If you pay through our website you’ll be covered by Payment Protection. Or you can send Cynthia/Cathleen (the owner) an enquiry through the contact form to request a quote. Cynthia/cathleen (the owner) will email you the total cost for your dates and how to pay. Send Cynthia/Cathleen (the owner) an enquiry through the contact form requesting a quote for your holiday dates. Cynthia/cathleen (the owner) will email you the total cost for your dates and how to pay. Cynthia/cathleen (the owner) of this property is responsible for taking and refunding your damage deposit. The damage deposit terms should be agreed before booking and outlined in the booking contract, if Cynthia/Cathleen (the owner) supplies one. Please refer to these details or contact Cynthia/Cathleen (the owner) directly if you have any questions. You'll need to contact Cynthia/Cathleen (the owner) to cancel. They should have provided their contact details when you made your booking - otherwise, email them through the contact form. You'll need to contact Cynthia/Cathleen (the owner) to edit your booking. They should have provided their contact details when you made your booking - otherwise, email them through the contact form. Estimated price per night based on a weekly stay. Owner fees of £122.00 per stay may apply. Enter your dates to see the total cost.